The compact, rugged and manoeuvrable J Series forklift from TASK Australia. TASK Australia will release a new electric forklift at Safety In Action and Materials & Manual Handling, which runs from 21-23 March in Melbourne. The Osko Max J series electric three-wheeled forklift is the latest addition to the existing Max gas and diesel range. 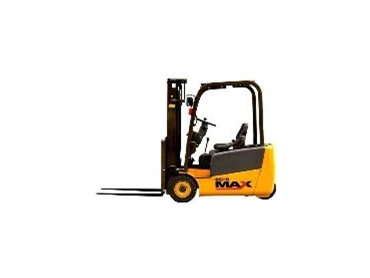 A compact, yet powerful, heavy-duty electric forklift, the Max J series is robust and extremely manoeuvrable. Task Australia highly recommends the series for tight working conditions but says its quietness and energy efficiency will prove popular for many applications. The Max E series is also available in an electric four-wheel version. Another Task highlight will be the Australian-made Sumi battery operated electric stackers and pallet trucks, particularly the MDS stacker with its optional side shift facility. The facility allows users to work with ease around the unit's straddle legs during unloading, block stacking or pallet retrieval. The Sumi HPT hand pallet truck will also be on display with an optional handbrake as an added safety feature. Proudly Australian owned, Task supplies units as rentals, brand new and used, with full nationwide service support. Visit TASK at stand M02 of Safety In Action and Materials & Manual Handling from Monday 21 to Wednesday 23 March 2005 at the Melbourne Exhibition Centre. For more information or to register online, visit www.safetyinaction.net.au, phone Australian Exhibitions & Conferences on (03) 9654 7773 or email safety@aec.net.au.